Posted in: Internet and Mobiles. Tagged: Barcelona, Helsinki, Mobile Market, Paris. In July it was getting too hot for me in Barcelona. I had finished coding of my music discovery app for Barcelona Culture Applications contest but wasn’t able to participate there because I lacked a bankcard to open Apple developers account and also Facebook demanded a bankcard in file to register any mobile app there. So, I decided to go to Paris as I have done previous years. In Barcelona, the only time your brains where working was early mornings 4-5AM when I went to the beach, saw so many full or nearly full bear cans so as I didn’t wanted to throw a way such kind of good stuff, I started to drink those. And by 9AM I was fully drunk unable to do anything useful afterwards. I started my trip as walking trip by walking out from Barcelona using national road N2 which goes something 60 kilometres bypassing coastal villages. I have previously hitchhiked this road and have got after some waiting time a ride few kilometres forward. But when this time I really walked it. After I had reached VIllasar de Mar and walked thru it to the place where sometimes I got a ride, I remembered that the town Matoro was nearby so decided to walk thru that as well. It was sunday morning and when I found that some nice people had left one euro to the park bench for me to find, I was more than happy that somebody had sponsored my wine. And as I remembered, somewhere in Pineada de Mar, there are supermarkets open on sunday mornings and it wasn’t much long way from Matoro, I started to walk there. But I had forgotten than meanwhile the road goes tens of kilometres up to the cliffs and it was extremely hot day as well to walk those. My t-shirt was totally wet and my pants rub my skin. When I finally reached Pineada de Mar, it was already midnight so next day I continued my walk until N2 turns towards Girona and had nice places to hitchhike. But same situation was in Paris. After you have eaten your daily meal in Mother Theresa place around 10AM, you want to do something useful with your computer. But their libraries will open around 2PM during summer holidays. So you have to wait in the park. And to have my waiting time not boring, I purchased a bottle of their wine. And when libraries finally will open, you think that maybe today isn’t my day to do useful staff and maybe I should go for another bottle of wine. So the time just passed by. 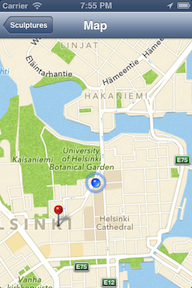 When I got information that City of Helsinki is running next mobile app competition I was eager to participate. I planned and coded some screens in Paris. But Paris wasn’t much a place to finish my app so I decided to get myself Finland where the weather was much better for my brains to work. I registered myself to that competition, tried several Helsinki City open datasets and found that using statues, memorials and public art database could be most interesting for me to wrote to iPhone app. There are something 500 of those in the City and obviously not much people know where those places are to visit them. Even I got stuck first in Bryxelles round, then made stop in Hamburg and afterwards was stuck again around two kilometres before Stockholm a nice town called Arebro. It had several entrances to motorway so after few days trying most of them out, I finally got a ride to move forward from there. Somewhere after Arlanda Airport and around 20 kilometres before Stockholm I made the decision to walk again. There was a bike track showing City Centre and by the midnight I had walked there. Actually one Iranian refugee took me from that place and asking passport. When I showed my ID card, this didn’t satisfied him so he throw me out in the middle of motorway. But hitchhiking over the Lapland having only shorts and t-shirt sounded too risky I had to get to the ferry. Nice people had gave me a little bit money so I had some 7 EURos in my pocket. But the girl in ticket office for ferry to Turku asked 17 EURos. When I told to the girl that I have only 7 EURos and I have to get to the Finland, she told “with that money you never get to Finland”. So I told “but with such kind of money I could get back to Paris”. So, obviously Finland should be an very expensive country. Finally I got a sponsor from an Estonian woman living in Stockholm giving me enough money for the ferry. I was in Turku. The rain started. and Finland really was an expensive country. Even the cup of coffee cost there something 2 EURos and I had to take them several waiting the rain to stop. As I discovered even from Sweden, hitchhikers are very rare on those countries. So when the rain stopped, I went to the road and one luxury sport car stopped. A guy first asks from me have I eaten and when I answered that I had a last warm meal in Hamburg he asked when that was. “Around two weeks ago” so he stopped nearby restaurant and purchased me a warm meal as much as I wanted to eat. Next thing he gave me two 500 EURo notes to have some bus money. With that money you can buy a bus and not a ticket so I had to find a bank willing to open an account to change it. Anyway, I had now found my sponsor to write a app and to stay in Finland. I had already written the main screen showing all the statues and was playing with MapKit being in Paris, so I had to create background processes downloading images and statue information texts as those where not on the result set I was getting. And then I had come to the idea that maybe there should have a walking competition that people can register themselves by visiting statues and my app measures the distances they are walking. Sure, other people would love their walking experiences as well as I have done? This made it a Helsinki Statue Walking Tour app and I was happy to have an idea behind the app as well to give users a reason visit those places rather than having a catalog. I spent some days in Toijola, then visited Tampere and finally visited those statues in Helsinki as well. To drink a wine in Finland was an interesting experience. First, they have priced those ridiculously high (something 10 EURos per bottle, compared my usual pricing level of something around one EURo range in Spain, France or Germany). Secondly you have to buy them in special shop and you can do it only once per day. It was nice sunny saturday and I had finished one bottle sitting in the rocks in the beach of their beautiful lake they had in Tampere; my brain worked well with app ideas so I went to get another bottle. But they told me there that I have already visited their shop today and can’t get back until monday? I had no intention to stay in Tampere until monday to get next bottle of wine. I never had encounter such kind of rules in Spain or France, so I better do my thinking process on those countries instead of Finland. Anyway, after Helsinki I had no reasons to be in Finland anymore so I took a ferry to Estonia visiting friends and family there. And finished app coding there within few days. Sorted out my bankcard as well hoping to pay for Apple Developers Account but as I found out later, they expected to have phone conversation with me as well before accepting my payment. So, to pay them I had to change my address to Estonian one but my mobile was still Spanish one? I can reside and work anywhere in Europe to provide and use services to any EU business without any restrictions so why Apple doesn’t accept it. Now I have to change my address again to Barcelona and then they can’t accept my bankcard? Meanwhile they had delayed their competition starting date and I had written most of the app before even competition started. And the weather turned to autumn in Estonia (and Finland), so I was in hurry to get back south. Leaving Estonia was quick. After I started from Tartu, the first guy took me some eight kilometres to next village called Ylenurme, next girl got me near Elva something twenty kilometres away and third was a truck getting me next evening to few hundred kilometres from Poland-Germany border by next evening. Even offered shelter for nigh in Poland because it was heavily raining there. Next day I walked over the Poland-Germany border towns having a bottle of Polish Vodka with me and was happy to take some time off. Getting to Berlin the weather changed again. It was so cold and rainy so I had a need to get more south as quickly as possible. But my luck had changed as well. Being stuck in Brandenburg and Magdeburg unable to get any ride south on motorway, I just walked national roads to get warm until after Hannover I was able to get south. So, visited Dortmund and Koln and got truck to Saarlous where I decided to walk again small road leading to Metz in France around 50 kilometres. As the motorway in Metz was from city centre unable to hitchhike there I had to walk out from the city to the shopping centres area (that’s huge BTW) and tried to get any ride with my Lyon sign there several days without any luck. I had run out of tobacco so walked all nearest villages hoping to find any small local caffees selling tobacco and newspapers without any luck. That’s how supermarkets had changed France. There are now only church and Marie in every village without any businesses. And agricultural fields has changed to supermarkets areas which cannot sell tobacco by French laws. So, finally changed the sign to next town – Nancy and got ride there. And the weather really turned bad there. It was over a week when I tried to get any ride. Cold and rainy wind so after an hour or so in road, I walked back to McDonalds for a warm coffee and when rain stopped, tried again without any luck. So, finally I decided to buy a train ticket to next town Toul and started to walk on national road there. After some tens of kilometres I walk back to try the motorway and got ride little bit south – Dijon. It was so surprising for me how the climate in France could be totally different after around hundred kilometres. Getting out from Lyon again something hundred kilometres there was nice summer weather, they just had a thunderstorm, the air was wet and hot. Usually it takes two days for me to get from Nimes to Bareclona but this time even this route was a delay. One long hair guy living in his van was thinking that maybe I would like to walk over the Pyrenees using small mountain track and when someone had taken me more closer to Barcelona but it was a road I had never travelled before. So, I just hitchhiked back to the national road going thru those beach villages familiar for me. So, to be in time in Barcelona to submit my app to the competition I just had to take a train again. So, I had only few hours left to get my app icon, make an video and fill the submission forms before deadline. So, obviously the app icon and video could have been better quality if I would have arrived earlier. Anyway, now I trying to get text to speech functionality work that my app will read statue description when selected as it scrolls in header as well. I got the list of competitors and that’s a big list so I have no hope winning the competition. But anyway, when I will get finally my Apple developers account sorted out and iStore accept this app, you have the possibility to walk all Statues visiting Helsinki. Interested to test my app?